Though tomorrow is the official deadline to file your personal Income taxes, it is not the end of the road for you. You can legally, postpone your Official Tax Due date to October by simply E-filing Federal Extension Tax Form 4868. 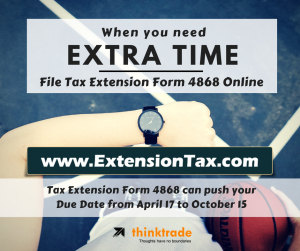 Form 4868– Application for Automatic Extension of Time to File U.S. Individual Income Tax Return. The best and easiest way to file for an Extension is through an IRS Authorized E-file Service Provider like www.ExtensionTax.com . The web application is so simple that you can actually complete the filing process before you complete reading this article.